Lots of students have been getting in touch with us asking how to make a proper plan for studying. Making a good study plan is a really important step in the studying process as it helps you stay organised, reduces stress, as well as helping you keep track of what you’ve done. Check out these 5 tips for making a good study plan. 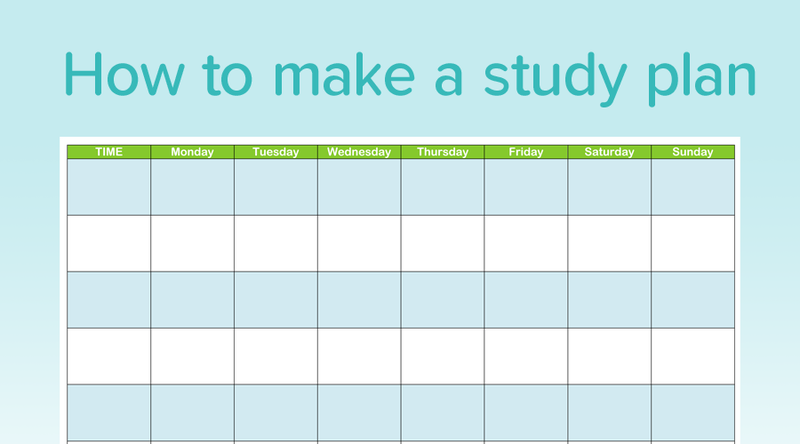 We recommend you make a new study plan for each week ahead. You can download a free study plan here, print it and then write in your tasks. Fill in all the things you have to do for the week (for example, football training, piano lesson etc). This way you won’t feel stressed that you should be studying when you are doing these activities because you have planned for them well in advance. Instead of writing down just a subject’s name try to be more specific and give yourself a more defined task (for example, “Do exam questions on Trigonometry” is better than just “Maths”). It’s very common for you to lose focus and get the feeling that nothing is going in. One of the best ways to stay focused is to do active learning by trying some past exam questions after you have completed any topic. A Studyclix PLUS+ or PREMIUM account makes this easy by allowing you to print all past questions by topic with the marking schemes. In fact, 95% of students who used it last year said it helped improve their grades.